Heldorado is an annual parade celebrating Las Vegas as a frontier town. Roy is captain of the guards at Boulder Dam. He helps celebrate the town's anniversary while capturing racketeers involved with the local casinos. Dorothy Bryant: [singing] Now, way down upon the Swanee River, / Folks keep jivin' all the day long; / 'Cause that's where I'm gonna stay forever / With a gate who'll make my life a song. / So honey chile, on that day, / When you come my way, / I'll say, "Thank Dixie for me!" Dorothy Bryant: How'd it look, Stel? 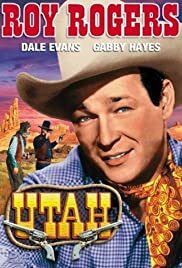 "Utah" is a light Roy Rogers Western with the whole gang - Dale Evans, Gabby Hayes, and of course Trigger. Except for some nice scenery, it is undistinguished, but it is a good way to pass a pleasant hour. The picture begins with Dale as a member of a singing and dancing troupe in Chicago, whose act might have to disband because of lack of backing. Dale remembers that her grandfather left her a ranch in Utah - she has never seen the ranch, but decides that selling it might be a good way of raising money to keep the show afloat. So she heads west, taking the women in her show along for the ride. It turns out that the Bar-X Ranch is run by Roy and Gabby, who do not want to see it sold, since they know a big land speculator who has been just waiting to grab the Bar-X and replace the cattle with sheep. From there, events get pretty far-fetched, but entertaining. There are of course some cowboy songs, and there is a lot of cornball humor centering on the incongruity of a group of women from the city having to associate with a group of cowboys. Some of the humor is lame and dated, but the good-natured feel of the movie keeps it from becoming too annoying. One less routine aspect of "Utah" is the scenery - there are a lot of good background shots (for example, during the horse chase scenes) that remind us of Utah's rugged grandeur. "Utah" is good light entertainment for any fan of old Westerns.